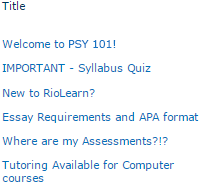 View Your Lessons Here is where you navigate your course, view syllabus and more. Click on the "Lessons" link above to view your course introduction and lessons. This is where your instructor will provide a brief introduction about themselves. They may include their education, years of services to the college, and possibly, some personal information. They may also include a picture. RioPACERioPACE stands for "Progress and Course Engagement." It monitors your engagement and interaction within your course. Watch this video to learn more.